Doubt and disbelief live in the hearts of many people as they wrestle with the questions of good and evil and the existence of God. Those who embrace Christianity as a way of life must then learn how to live out their faith as a transformed individual in an imperfect and difficult world. But how is this accomplished?  How do we know right from wrong?  If a good God made the world, why has it gone wrong?  Why did God give us free will to choose to do good and evil?  Is Christianity a bargain in which we are rewarded for doing good things and punished for doing bad things?  Is it enough to believe in God without believing in Him personally?  Can you believe Jesus was a good moral teacher but not the Saviour of the world? Those who journey to the heart of Lewis's most famous apologetic work will find that the longest way roundthe hard way of discipleship, of learning to truly love God and manis the shortest, and only way home. The Shortest Way Home: C.S. Lewis & Mere Christianity DVD by Vision Video was published by Vision Video in February 2014 and is our 15010th best seller. The ISBN for The Shortest Way Home: C.S. Lewis & Mere Christianity DVD is 501563D. 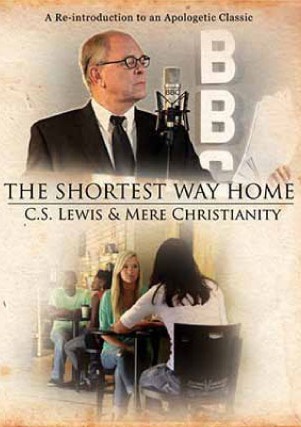 Be the first to review The Shortest Way Home: C.S. Lewis & Mere Christianity DVD! Got a question? No problem! Just click here to ask us about The Shortest Way Home: C.S. Lewis & Mere Christianity DVD.